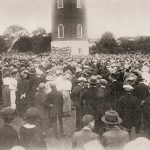 At the end of World War One the citizens of Loughborough were asked what sort of memorial would be appropriate to honor the 478 men who gave their life in that tragic event. Suggestions included a statue or cross, a health center and a football pitch. 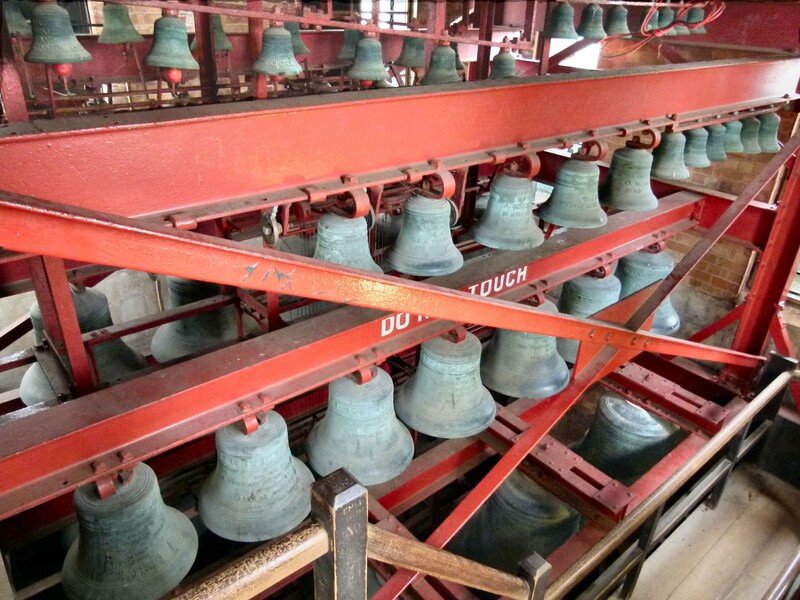 The idea of a carillon gained popularity because many lives had been lost in the fields of Flanders where the melodious sound from the many carillons in the area could be heard. 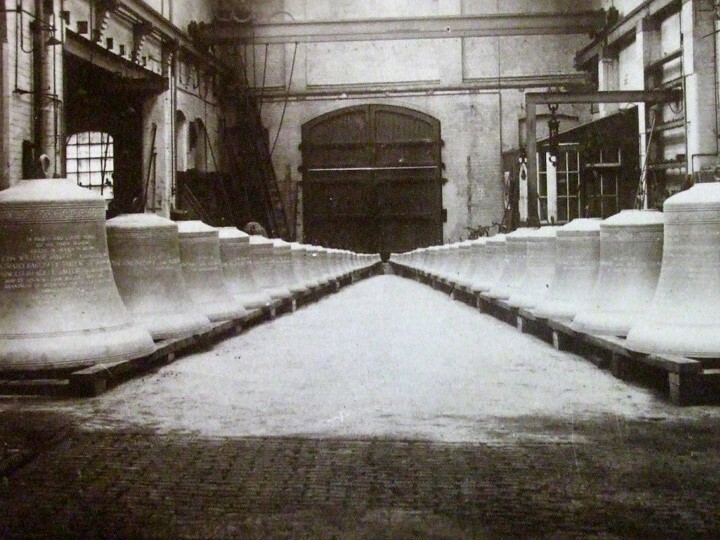 Loughborough was the home of a bell foundry whose owners had lost four sons in the conflicts. The town had its own brick works and construction skills which all added to the feasibility. 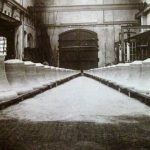 Of the original cost of £20,000 it was a gratifying feature that a considerable proportion of the amount needed was met by organized weekly collections in both schools and factories and this can also be seen on the inscriptions on the bells. Building work commenced in November 1921, the foundation ceremony on 22 January 1922 and the inauguration was on the 22 July 1923. The first part of the ceremony was performed by Field Marshall Sir William Robertson and the dedication which followed was by the Lord Bishop of Peterborough Dr Woods. City Carillonneur Jef Denyn closed his inaugural recital with a premiere performance of Memorial Chimes, a carillon piece that Edward Elgar had written for the occasion. 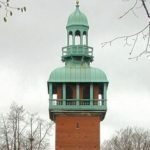 Until the 1980’s, apart from regular recitals, the tower was used as storage space for the park’s maintenance equipment but today houses a fine museum featuring the Leicestershire Yeomanry on the first floor and a significant collection of artifacts from more recent battles on the second floor. 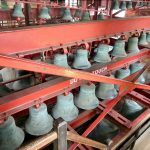 The carillon is played twice a week during the summer months and once a month during the closed winter season. Bell-founder John Taylor & Co.
Carillonneurs Caroline Sharpe, assisted by Dr. Lynne Morgan. 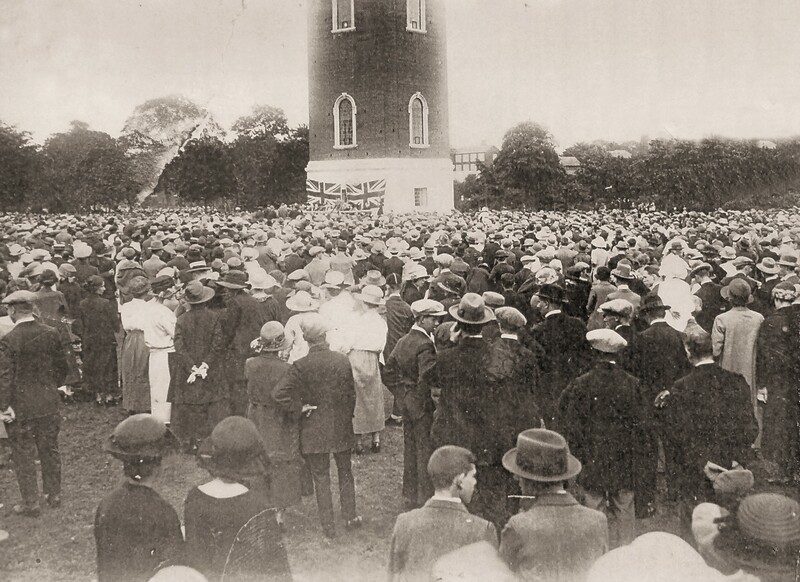 Edmund Denison Taylor, the founder of these bells, gives this, the largest, 1923.